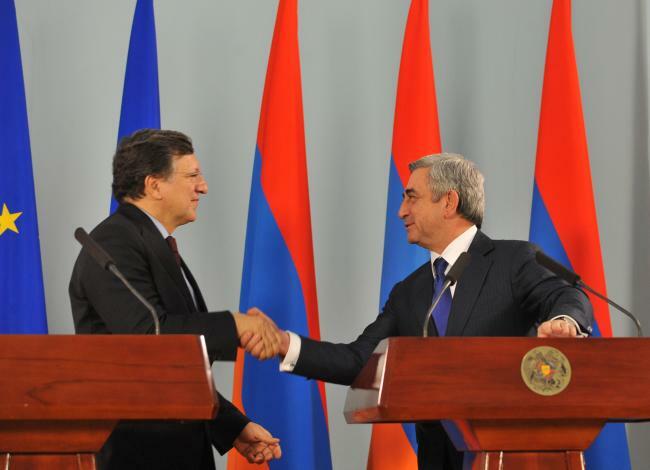 On February 18, 2013 Armenia is going to be asked to elect a new President. The 2013 Presidential election campaign officially launched today (21 January 2013), as ArmeniaNow.com reported. And the candidates are already known: Serzh Sargsyan (see his campaign platform here), the Armenian President in office; Hrant Bagratyan (see his campaign platform here), a former prime minister and the leader of Freedom party; Raffi Hovhannisian (see his campaign platform here), a former foreign minister and the leader of Zharangutiun (Heritage) party; Paruyr Hayrikyan (see his campaign platform here), a prominent Soviet-era dissident and the head of the National Self-Determination Party; Arman Melikyan, a former foreign minister of Nagorno-Karabakh Republic; Andrias Ghukasyan, a political analyst and head of Radio Hay; Vardan Sedrakyan, a specialist in epics, and Aram Harutyunyan, leader of National Consent party will compete for the Presidency. However, Stepa Safaryan, general secretary of Zharangutiun (Heritage) party pointed out Serzh Sargsyan and Raffi Hovannisian as most likely vote-getters in the presidential elections, cited by Arka News Agency. Of course, the other candidates could seek avenues to mount a challenge to the present president. But the opposition is so fragmentated and no one of the candidates is going to back any of the eight candidates running for president in Armenia, as ArmeniaNow.com reported. It is inevitable that there would be disputes about the outcome of the election. But the Justice Minister Hrayr Tovmasyan points out in advance that the 2013 presidential election will be most democratic in Armenia’s history. “I am convinced that this election will be most stainless and democratic and that it will leave behind all the previous elections,” he was quoted. Armenian Police Vladimir Gasparyan speaking at the opening of a three-day workshop for prosecutors and defense attorneys in Yerevan stated that Armenia will pass the upcoming election test with brilliance, he was quoted. Does Europe trust them to play their part correctly as guardian of the Justice? Or does Europe trust Foreign Minister Edward Nalbandian who also stated that the Armenian government is committed to holding next month’s presidential election in conformity with European standards. Election in conformity with European standards will be the key, but it seems to me a matter of great urgency that there will be another reality. Of course it is hard to expect from Non-EU member to compete with standards within the European Union, although member states faces many difficulties coming from membership. "(T)he expansion of EU decision making limits the range of party policy positions at elections. Policy convergence means parties taking positions in the issue space closer to those held by their rivals and that consequently the distribution of party positions becomes more compact. EU legislation restricts the policy alternatives available to governments and, due to the electoral link, to parties and citizens. The more responsibility is assigned to the EU, the less room there is for parties to offer credible policy alternatives that differ markedly from EU legislation," Kyriaki Nanou and Han Dorussen argue. The EU would be well advised to set very ambitious targets for its Eastern Partnership policy as the evident risks to democracy in the immediate neighbourhood call for greater sustainability and consequence. What is happening with freedoms in Armenia? The truth is that time is running out and there is still a lot to be done in Armenia. Recently Freedom House, Control Risks, Fraser Institute, World Economic Forum and Price Waterhouse Cooper published their recent reports on freedoms in the world. But actual results differ from those reflected in the forward-looking statements. Regarding Freedom House report "Freedom in the World 2013" Armenia is a partly free country, the net is partly free, but the press is not free. The regime is classified as a semi-consolidated authoritarian regime. Due to the "RiskMap Report 2013" Armenia is presented as a country with high political and security risks. On issues related the economy for Armenia is some light at the end of the tunnel. The Fraser Institute report "Economic Freedom of the World" ranks Armenia #53 and considers it as a relatively free country. The 2013 election should be a signal to Europe: We are carrying out our European path. The World Economic Forum report "The Global Enabling Trade Report 2012" ranks Armenia #13 worldwide for market access and #59 in terms of the overall extent to which it has developed institutions, policies, and services facilitating the free flow of goods over borders. Concerns are coming from other sides, too. Policy Forum Armenia report, entitled “Armenia’s 2012 Parliamentary Election” summarizes: "(The report) demonstrates that the election fraud in Armenia has taken subtle and sophisticated forms that are difficult to detect because it occurs mostly outside of the polling stations. In fact, while acknowledging some marginal improvements, we believe that the systematic fraud applied by the authorities (and uncovered in the Report via the use of statistical techniques) was sufficient to materially alter the election outcome." So there are a lot of issues to be solved before the election. Analyzing the results I conclude: In terms of democratic freedoms Armenia demonstrates a lack of political commitment on democracy progress. In terms of economic freedoms Armenia is making some valuable progress. These developments could have consequences for the relations with the European Union and Russia. But is the European Union prepared for surprises? 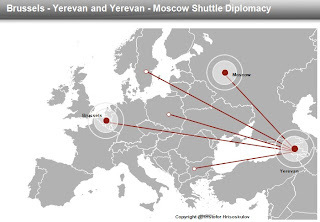 A lot of diplomats "shuttled" between Brussels and Yerevan and vice versa in 2012 and at the beginning of 2013. On the European side, Herman van Rompuy, Jose Manuel Barroso, Stefan Füle and Catherine Ashton visited Yerevan. The EU member states Bulgaria, Sweden and Poland supported the EU in this context. In December 2012 Bulgarian Foreign Minister Nikolay Mladenov, Swedish Foreign Minister Carl Bildt, and Polish Foreign Minister Radoslav Sikorski paid a visit to Armenia during a trip in the South Caucasus. On the Armenian side, Serzh Sargsyan (President of Armenia), Tigran Sargsyan (Prime Minister), Hovik Abramyan (Speaker of the Armenian Parliament), Gagik Tsarukyan (Leader of the Armenian political party "Prosperous Armenia") and Edward Nalbandian (Armenian Foreign Minsiter) visited Brussels. The question is: What is hidden behind all the statemnets made after every meeting? In order to answer the question I picked up four words, namely elections, Association Agreement, visa (agreement, facilitation and liberalization) and Europ+EU as repeated in the statements attached as a link behind the mentioned names above. In this way a specific picture of EU-Armenia relations shifted into the foreground as a model of future relations: There are more "sticks" than "carrots" for EU support of EU-Armenian relations. The words "Association Agreemnet" and "visa (agreement, facilitation and liberalization)" have been used by the officials 17 times, whereas the word "elections" - 19 times. "Association Agreement" and "visa" appear in the context of offering something, of rewarding some performance done, whereas "elections" has been used in the context of advising and instructing the other part (in this sense Armenia) to be crucial on the upcoming events in the country. With regard to "Europe+EU" (counted 66 times) I should like briefly to go into the common proposals in the statements which now come within a wider context; this applies, for example, to the proposal on supporting the European path of Armenia and confirming the approach already taken. It seems that "European officials are still skeptical about the Armenian government’s intention to integrate with the European community. They do not completely trust these assurances as all steps taken by Armenia so far in this direction have mostly been of a declarative nature. Meanwhile, democratic reforms that are a condition for European integration have not become tangible in Armenia yet. (...) Still, political analyst Levon Margaryan thinks that the relations between Armenia and the EU have been taken to a new level where Armenia should prove that it is ready to bring not only its laws, but also practices in line with European standards," as ArmeniaNow.com reported. Growing competition between the West and Russia for influence in Armenia: Economy and democracy vs. Security? A lot of diplomats "shuttled" between Yerevan and Moscow, too. Armenian President Serzh Sargsyan visited Russia attending the summits of the CIS and the Russia-dominated Collective Security Treaty Organization (CSTO), Vladimir Putin, Dmitri Medvedev and Chairman of both Chambers of the State Duma and ministers visited on their side Yerevan. And Mr. Putin goes further: "I want to reiterate that the countries of the Commonwealth are our most intimate – in the true sense of the word – strategic partners. Virtually all aspects of interaction with you are vital for our country," Putin said cited by Massis Post. It was not without reason that US Foreign Minister Hillary Clinton warned on the situation in the Post-Soviet space and the rising attempts of Vladimir Putin to get closer to Russia all the neighbouring countries. As she stated: "There is a move to re-Sovietise the region." Andrew Weiss, who served on the National Security Council under President Bill Clinton and now is at the US Rand Corporation think-tank, said Mr. Putin made clear when he returned to the presidency this year that he planned to focus on bolstering Russia’s influence in its neighbourhood. But he added: "Elites in the neighbouring states show little enthusiasm for simply handing over their autonomy and sovereignty to Moscow," Charles Clover writes in the Financial Times. "2012 has showed that Armenian authorities feel like developing closer relations with the West, but are not going to spoil relations with Russia. 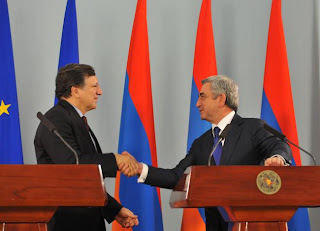 Moreover, a certain division of labor could be noticed – Armenia seems to have entrusted its security to Russia, as a member of the Collective Security Treaty Organization, but is seeking to integrate with the European Union and develop closer ties with the United States in terms of economy and democracy," ArmeniaNow.com reported. And Secretary of Armenia’s National Security Council Artur Baghdasaryan believes that Armenia’s integration into the European Union (EU) should not be contrasted with its integration into the Eurasian Union, Tert.am reports. Russian news agencies, citing the Kremlin, disseminated a slightly odd piece of information saying that “Russian President Vladimir Putin has agreed with the government’s proposal to hold talks with Armenia for the signing of the agreement on the development of military-technical cooperation” and that “after the conclusion of the negotiations the Government has been instructed to sign an agreement with this country”, as ArmeniaNow.com reported. And Lisa Karpova in Pravda.ru: "To further develop Russian-Armenian cooperation, President Vladimir Putin's Government appointed the Russian Transport Minister, Maxim Sokolov, as co-chairman for the bilateral commission, which has the task of drafting a roadmap of Russian-Armenian economic relations until 2020." A joint document was signed after Dmitri Medvedev visited Armenia. It envisaged Russian military presence in Armenia and joint protection of Armenia’s borders by the Armenian and Russian armed forces, as Tert.am reported. Due to its geographic location Armenia is really concerned on security issues. For sure, the Nagorno-Karabakh conflict and other conflicts in the immediate neighbourhood are topics that should be taken into consideration regarding Armeian foreign policy. Gordon N. Bardos in his article "Spectre of Separatism Haunts Europe" in The National Interest argues that "Balkans and the Caucasus (are) the stuff of nightmares for cartographers and diplomats trying to reconcile competing ethnic claims to territory. In the Caucasus and eastern Anatolia, Abkhazia, Chechnya, Nagorno-Karabakh, South Ossetia, the Kurds of eastern Turkey and northern Iraq, and the Turks of northern Cyprus have all declared some form of independence or autonomy". Of course, in accordance with Russian offers the European Union is asked to do more than statements: "The EU has a strong interest in a stable neighbourhood; this is the raison d'etre of our European Neighbourhood and Eastern Partnership policies. The EU actively supports the mediation process of the OSCE Minsk Group, we have important assistance projects to build confidence between the parties to the conflict, while the efforts of our EU Special Representative for the South Caucasus and the conflict in Georgia, Ambassador Lefort, fully support the efforts of the Minsk Group in a complementary way", Jose Manuel Barroso stated in a interview with Mediamax. It is therefore my view that the European Union would have been well-advised to precisely follow the thinking in Armenia, but consequently and sustainable to stand up for rights, international conventions and democracy and also strongly reaffirm as a pressing requirement of free and fair elections.